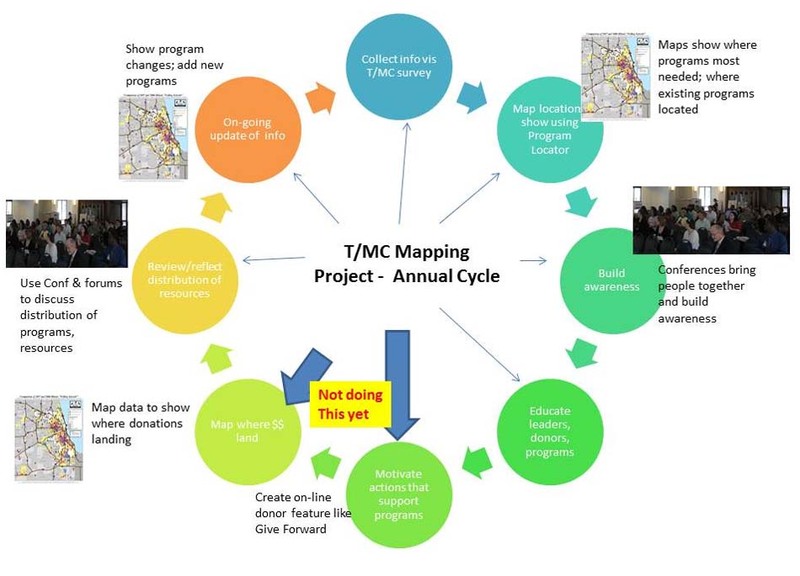 This graphic represents the vision of Dan Bassill and the Tutor/Mentor Connection (T/MC) which began to pilot a use of maps in 1993. 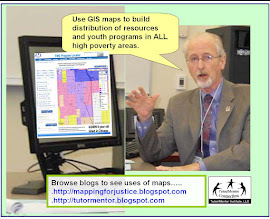 This shows a cycle of collecting information about non-school, volunteer-based tutor/mentor programs operating in the Chicago region, and using maps to show where these programs are most needed, based on poverty, poorly performing schools, violence, etc. The strategy is based on what big companies like Sears, WalMart, Bank of America, etc do to support thousands of branch locations with central organizing, planning and advertising strategies. The T/MC wants to help high-quality, constantly improving tutor/mentor programs reach kids in high poverty neighborhoods of Chicago and other urban areas in the USA and the world. We have never had enough resources to do this so the graphic on the chart shows some actions that we do, but not with enough impact, and some actions that we will do when we find investors and partners to help us. We outline the GIS strategy on this WIKI along with other complementary strategies that make our use of maps unique. If you want to help implement this strategy in Chicago, or in your own city, please email tutormentor2@earthlink.net and offer your time, talent and/or dollars. We cannot do as much working alone as we can with the help of others who might benefit from what we're trying to do.